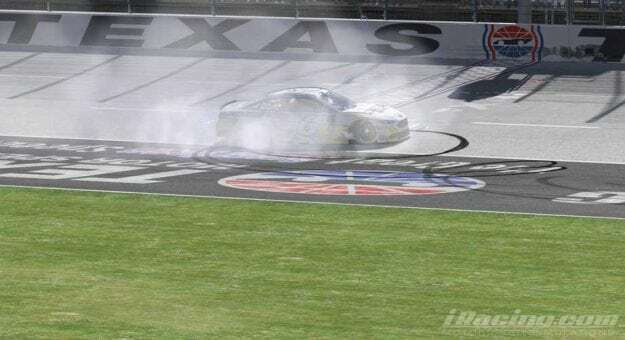 Ryan Luza was back to his dominant self at Texas Motor Speedway, winning his fourth NASCAR PEAK Antifreeze iRacing Series event of 2018. The victory also locked Luza into the playoffs as he looks to win back-to-back titles. Michael Conti finished second, a result that also puts him in the playoffs and in a great position to challenge for his second championship. For a moment, Conti looked to have the speed to challenge Luza for the win as the laps wound down, but he ultimately came up short as Luza had too much speed very late into a run. Nick Ottinger crossed the line third, also earning a spot in the playoffs. Colton Davis came home fourth, a much-needed top-five result in his quest to break into the top 20 in the standings. Brian Schoenburg completed the top five. Keegan Leahy won his second pole of the season and looked strong early, pulling out to an early lead and pacing the field for the first 28 laps. Leahy’s speed fell off as the tires wore, though, and Luza slipped by on Lap 29 and looked to pull away. On Lap 41, Leahy decided to short pit and incurred a pit road penalty, which led to a 29th-place finish. The track became multi-groove shortly after the green flag with some drivers finding success on the bottom while others made time around the corners, inches off the outside wall. With plenty of room to race, the field of 33 cars ran caution-free, allowing for varying pit strategies. The two-stop strategy won out over the three-stop option, as spending less time in the pits was worth more than fresher tires. Often, the leaders can be drawn in by drivers short pitting as staying out on older tires can cost several seconds of time. However, this time several of the leaders stayed the course on their two-stop strategy and it paid off. The top six all played the two-stop strategy with Ray Alfalla in seventh being the first driver across the line who visited pit road three times. Next week, the five-race playoffs begins at Darlington Raceway. The field for the playoffs is locked in and features the top eight drivers including three past NASCAR PEAK Antifreeze iRacing Series champions. The final eight who will battle for the championship over the next nine weeks are: Ryan Luza (2017 Champion), Keegan Leahy, Ray Alfalla (3-time champion), Bobby Zalenski, Nick Ottinger, Nickolas Shelton, Michael Conti (2014 Champion) and Matt Bussa. The first four races of the playoffs will determine the final four drivers – who will compete for the championship in the final race at Homestead-Miami where the highest finisher from the final four is crowned champion and earns the $10,000 cash, NASCAR ring and NASCAR trophy. Tune in next Tuesday night at 9pm at www.iRacing.com/live to watch the race from Darlington Raceway.